Kraemer relocated the 95-year-old UPRR Marysville Railroad Bridge over the Big Blue River near Marysville, KS. Kraemer kept all rail lines operational during relocation using a two-phased approach. In Phase 1, Kraemer built the new bridge approaches, salvaged a 180-foot road span and floated it down river to shore. Kraemer also erected 160-foot steel girders that weighed more than 100 tons each. The road span was then connected to the girders and the bridge was opened to train traffic. 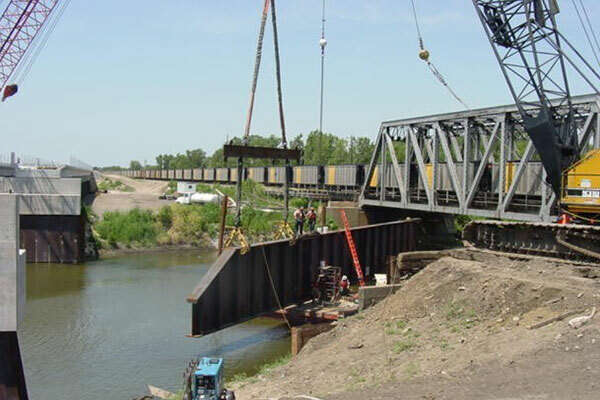 In Phase 2, Kraemer salvaged a 180-foot truss span, floated it down river, and set it onto new piers. Once the truss was opened to train traffic, Kraemer completed the demolition on the existing truss span. The Big Blue River fluctuates six feet over night with heavy rains. To meet the challenge of fluctuating river conditions, Kraemer positioned two cranes on the new bridge deck, one on each side of the river, rather than setting a crane on barges to erect girders. Kraemer also assembled the girders on barges and used a two-crane picks to set them into position.